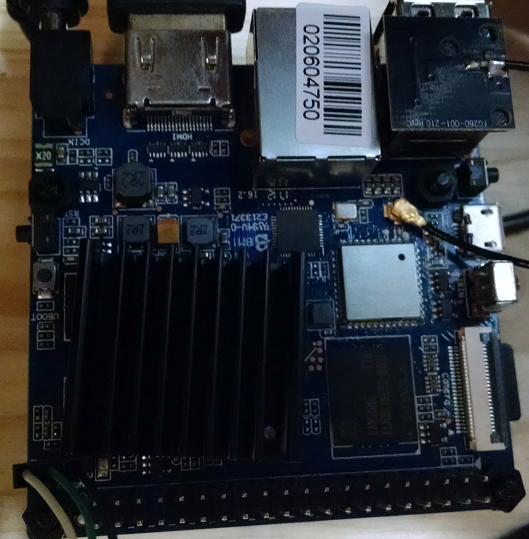 Please Note: As of H3Droid 1.3.3 the BananaPi M2+ is now fully supported. You can now set uboot and fex directly from H3resc without modifications. In this post we will go through the changes needed to get H3Droid 1.3.2 to run on the BananaPi M2+ (both the H2+ and H3 versions). We have found that with these settings that both of the BananaPi M2+ versions (H2+ and H3) perform best and offer stable operation. Please note that these boards are set to a constant VDD_CPUX voltage of 1.3 Volts and as such the boards run HOT. We recommend using a heatsink on both your SoC and RAM to help cool things during operation. If available, a single heatsink which can cover both works well. Without a heatsink it is possible you may see overheating issues with these boards. With proper heatsink during normal operations the SoC is reporting a temperature of 40-48 Celcius, without you could see temperatures over 70 Celcius and a lot of throttling. As more work is done with these boards we will update this blog post to reflect updated settings. Thanks to Sinovoip for providing us with the BananaPi M2+ H2+ and BananaPi M2+ H3 sample boards so that we can test and come up with the most optimized settings for use with their boards!